This article is about the alphabet used to write the Latin language. For modern alphabets derived from it used in other languages and applications, see Latin script and Latin-script alphabet. Due to its use in writing Germanic, Romance, and other languages first in Europe and then in other parts of the world, and due to its use in Romanizing writing of other languages, it has become widespread (see Latin script). It is also used officially in China (separate from its ideographic writing) and has been adopted by Baltic and some Slavic states. The Latin alphabet evolved from the visually similar Cumaean Greek version of the Greek alphabet, which was itself descended from the Phoenician abjad, which in turn derived from Egyptian hieroglyphics. The Etruscans, who ruled early Rome, adopted the Cumaean Greek alphabet, which was modified over time to become the Etruscan alphabet, which was in turn adopted and further modified by the Romans to produce the Latin alphabet. During the Middle Ages, the Latin alphabet was used (sometimes with modifications) for writing Romance languages, which are direct descendants of Latin, as well as Celtic, Germanic, Baltic, and some Slavic languages. With the age of colonialism and Christian evangelism, the Latin script spread beyond Europe, coming into use for writing indigenous American, Australian, Austronesian, Austroasiatic, and African languages. More recently, linguists have also tended to prefer the Latin script or the International Phonetic Alphabet (itself largely based on the Latin script) when transcribing or creating written standards for non-European languages, such as the African reference alphabet. 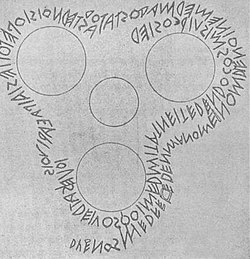 The term Latin alphabet may refer to either the alphabet used to write Latin (as described in this article), or other alphabets based on the Latin script, which is the basic set of letters common to the various alphabets descended from the classical Latin alphabet, such as the English alphabet. These Latin-script alphabets may discard letters, like the Rotokas alphabet, or add new letters, like the Danish and Norwegian alphabets. Letter shapes have evolved over the centuries, including the development in Medieval Latin of lower-case, forms which did not exist in the Classical period alphabet. English is the only major modern European language requiring no diacritics for native words (although a diaeresis may be used in words such as "coöperation"). Latin included 21 different characters. The letter ⟨C⟩ was the western form of the Greek gamma, but it was used for the sounds /ɡ/ and /k/ alike, possibly under the influence of Etruscan, which might have lacked any voiced plosives. Later, probably during the 3rd century BC, the letter ⟨Z⟩ – unneeded to write Latin properly – was replaced with the new letter ⟨G⟩, a ⟨C⟩ modified with a small vertical stroke, which took its place in the alphabet. From then on, ⟨G⟩ represented the voiced plosive /ɡ/, while ⟨C⟩ was generally reserved for the voiceless plosive /k/. The letter ⟨K⟩ was used only rarely, in a small number of words such as Kalendae, often interchangeably with ⟨C⟩. 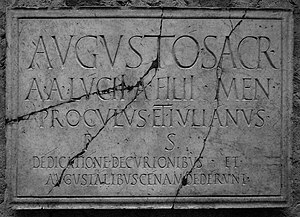 The apices in this first-century inscription are very light. (There is one over the ó in the first line.) The vowel I is written taller rather than taking an apex. The interpuncts are comma-shaped, an elaboration of a more typical triangular shape. From the shrine of the Augustales at Herculaneum. The Latin names of some of these letters are disputed; for example, ⟨H⟩ may have been called [ˈaha] or [ˈaka]. In general the Romans did not use the traditional (Semitic-derived) names as in Greek: the names of the plosives were formed by adding /eː/ to their sound (except for ⟨K⟩ and ⟨Q⟩, which needed different vowels to be distinguished from ⟨C⟩) and the names of the continuants consisted either of the bare sound, or the sound preceded by /e/. The letter ⟨Y⟩ when introduced was probably called "hy" /hyː/ as in Greek, the name upsilon not being in use yet, but this was changed to "i Graeca" (Greek i) as Latin speakers had difficulty distinguishing its foreign sound /y/ from /i/. ⟨Z⟩ was given its Greek name, zeta. This scheme has continued to be used by most modern European languages that have adopted the Latin alphabet. For the Latin sounds represented by the various letters see Latin spelling and pronunciation; for the names of the letters in English see English alphabet. Diacritics were not regularly used, but they did occur sometimes, the most common being the apex used to mark long vowels, which had previously sometimes been written doubled. However, in place of taking an apex, the letter i was written taller: ⟨á é ꟾ ó v́⟩. For example, what is today transcribed Lūciī a fīliī was written ⟨lv́ciꟾ·a·fꟾliꟾ⟩ in the inscription depicted. De chalcographiae inventione (1541, Mainz) with the 23 letters. J, U and W are missing. The languages that use the Latin script generally use capital letters to begin paragraphs and sentences and proper nouns. The rules for capitalization have changed over time, and different languages have varied in their rules for capitalization. Old English, for example, was rarely written with even proper nouns capitalized, whereas Modern English writers and printers of the 17th and 18th century frequently capitalized most and sometimes all nouns, which is still systematically done in Modern German, e.g. in the preamble and all of the United States Constitution: We the People of the United States, in Order to form a more perfect Union, establish Justice, insure domestic Tranquility, provide for the common defence, promote the general Welfare, and secure the Blessings of Liberty to ourselves and our Posterity, do ordain and establish this Constitution for the United States of America. This map shows the countries in the world that use only language(s) predominantly written in a Latin alphabet as the official (or de facto official) national language(s) in dark green. 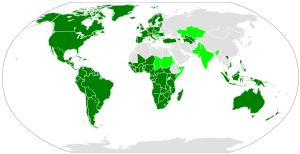 The lighter green indicates the countries that use a language predominantly written in a Latin alphabet as a co-official language at the national level. With the spread of Western Christianity during the Middle Ages, the script was gradually adopted by the peoples of northern Europe who spoke Celtic languages (displacing the Ogham alphabet) or Germanic languages (displacing earlier Runic alphabets), Baltic languages, as well as by the speakers of several Uralic languages, most notably Hungarian, Finnish and Estonian. The Latin alphabet came into use for writing the West Slavic languages and several South Slavic languages, as the people who spoke them adopted Roman Catholicism. Later, it was adopted by non-Catholic countries. Romanian, most of whose speakers are Eastern Orthodox, was the first major language to switch from Cyrillic to Latin script, doing so in the 19th century, although Moldova only did so after the Soviet collapse. It has also been increasingly adopted by majority Muslim Turkic-speaking countries, beginning with Turkey in the 1920s. After the Soviet collapse, Azerbaijan, Turkmenistan, and Uzbekistan all switched from Cyrillic to Latin. The Kazakh government announced in 2015 that the Latin alphabet will replace Cyrillic as the writing system for the Kazakh language by 2025. Asian countries see the lowest proportion of people using Latin script relative to alternative scripts. The spread of the Latin alphabet among previously illiterate peoples has inspired the creation of new writing systems, such as the Avoiuli alphabet in Vanuatu, which replaces the letters of the Latin alphabet with alternative symbols. ^ Michael C. Howard (2012), Transnationalism in Ancient and Medieval Societies. p. 23. ^ "The New Yorker's odd mark — the diaeresis". 16 December 2010. ^ Liberman, Anatoly (7 August 2013). "Alphabet soup, part 2: H and Y". Oxford Etymologist. Oxford University Press. Retrieved 3 October 2013. ^ Crystal, David (4 August 2003). "The Cambridge Encyclopedia of the English Language". Cambridge University Press – via Google Books. Rix, Helmut (1993). "La scrittura e la lingua". In Cristofani, Mauro (hrsg.) (ed.). Gli etruschi – Una nuova immagine. Firenze: Giunti. pp. S.199–227. Allen, W. Sidney (1978). "The names of the letters of the Latin alphabet (Appendix C)". Vox Latina – a guide to the pronunciation of classical Latin. Cambridge University Press. ISBN 0-521-22049-1.